Apache Tomcat, often referred to as Tomcat Server, is an open-source Java Servlet Container developed by the Apache Software Foundation (ASF). Tomcat implements several Java EE specifications including Java Servlet, JavaServer Pages (JSP), Java EL, and WebSocket, and provides a “pure Java” HTTP web server environment in which Java code can run. Eclipse Jetty is a Java HTTP (Web) server and Java Servlet container. While Web Servers are usually associated with serving documents to people, Jetty is now often used for machine to machine communications, usually within larger software frameworks. Jetty is developed as a free and open source project as part of the Eclipse Foundation. Netty is a non-blocking I/O client-server framework for the development of Java network applications such as protocol servers and clients. The asynchronous event-driven network application framework and tools are used to simplify network programming such as TCPand UDP socket servers. Netty includes an implementation of the reactor pattern of programming. Originally developed by JBoss, Netty is now developed and maintained by the Netty Project Community. Besides being an asynchronous network application framework, Netty also includes built-in HTTP, HTTP2, DNS and more protocols support, including the ability to run inside a servlet container, support for WebSockets, integration with Google Protocol Buffers, SSL/TLS support, support for SPDY protocol and support for message compression. Netty has been actively developed since 2004. As of version 4.0.0, Netty also supports the usage of NIO.2 as a backend, along with NIO and blocking Java sockets. 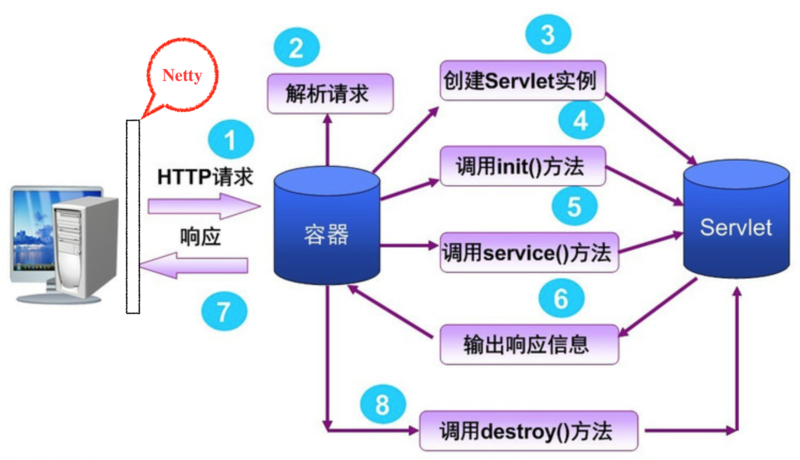 Servlet, Tomcat, Jetty, Netty, Mina 它们都是什么?